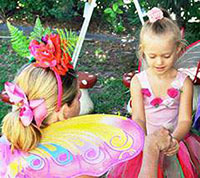 Would you love to create a special day for your little fairy and a magical memory that will be treasured forever? 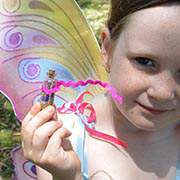 Imagine the surprise and smiles, when Fairy Flutter arrives all the way from fairyland in a sparkling dress to fill your daughter’s birthday tea party with magic, sparkles and fun. Relax and enjoy the special occasion, whilst the children are transported to a world of dreams and make-believe. There is so much fun to be had at a Fairies’ Toadstool Fairy Tea Party. 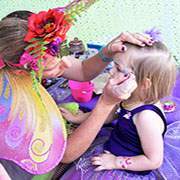 Our Fairy Tea Parties are held in our mobile fairy grotto, which is adorned with sparkles, flowers, butterflies, and of course lots of fairy dust. The birthday girl has her own special butterfly birthday chair and her guests will each have their own birthday toadstool. 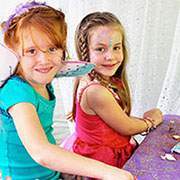 Fairy Flutters’ Fairy Tea Parties includes a birthday present for the birthday girl, lots of fairy themed games, dancing, fairy craft, bubbles and fairy-dust making. Fairy Flutter happily partakes in any cake-cutting and party photos.